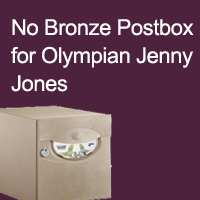 Did you read our previous post about South Gloucestershire Council's request for Royal Mail to grant a bronze Postbox in Olympian Jenny Jones honour? As the first ever Briton to win a medal on the snow at the Winter Olympics, many were shocked when the Royal Mail turned down their Bronze Postbox request. Jones local council said it would be the perfect way to celebrate her achievement. Jones success was clear at the Sochi, leading her local council to request a gesture, which would stand proud in Downend. One councilor said it was "a great pity" not to mark her success in some form. A similar request due to Lizzy Yarnold's skeleton sporting success for Britain, was also rejected by the Royal Mail. Royal Mail simply stated how London 2012 had been a "unique occasion" and how they would "not be repeating" the postbox declaration for the Winter Olympics 2014. Perhaps you're looking for a statement postbox to suit your property...? We provide a colourful range to choose from, including a modern designer postbox range, featuring bronze coloured designs. Or maybe you're simply looking for a statement piece an Olympian would be proud of....take a look at our multiple mailboxes on clearance currently. You may choose to design a multi-toned bronze postbox, using our custom painted postbox service.